Any retail location which sells tobacco products can receive retailer education from a Designated Youth Tobacco Utilization Representative. The training involves information about the Youth Tobacco Act which is the law defining retailer responsibility. Sign requirements are also part of the education. Retail stores that sell tobacco must post the state required sign. Checking identification & knowing the acceptable IDs is the retail clerk’s responsibility. The Food & Drug Administration requires a clerk to always ask anyone who is under 27 years old for ID. They must also know their employee’s policies. Clerks should: always hold the ID in their hand, make sure that it is not expired, check the picture to make sure that it is the same person as the ID, & check for alterations to the ID. 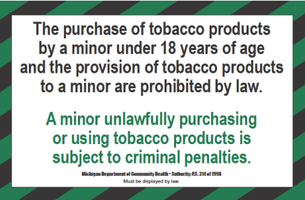 The consequences of selling to minors can include $50.00 fine to the store clerk. The retailer may face penalties from the Michigan Liquor Control Commission & Lottery Commission. If the retailer is ever in doubt, they may refuse the sale! KBA is excited to be bringing the No Cigs for Our Kids campaign to our region! Stay tuned for more information! For more information on your responsibilities as a tobacco retailer or to access state signs and/or resources, please click here. To check out our Tobacco Prevention Newsletter, please click here. Inspections of tobacco retailers using youth decoys are used to determine compliance with the Youth Tobacco Act. The success of the inspections is directly tied to treatment & prevention funding for the state. If you have any questions involving a compliance check that was conducted at your business, please contact us. Interactive classroom presentations geared to middle & high school classes are offered. Please call 810.225.9550 for more information or to schedule a presentation. ​ Presentations can cover "regular" tobacco products, e-cigarettes, or a combination of the two.